The Phillies beat Washington 3-2 Wednesday night due to a lack of run support. What Philadelphia did was take advantage of right-handed starter Edwin Jackson at the right times. This was Jackson’s third career start against the Phillies, and while he has beaten them once before earlier this year, Wednesday was a different story. Jackson threw five and two-thirds innings and gave up eight hits, three earned runs, four walks (one intentional), three homeruns, and struck out six over 108 pitches (63 for strikes). Wednesday wasn’t a complete failure though. 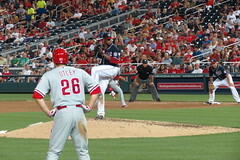 Jackson managed to strikeout Ryan Howard in all four of his plate appearances. Unfortunately, that didn’t stop the Phillies leadoff man and shortstop Jimmy Rollins from going long twice — once in the third inning to put his team on the board and once in the fifth to tie the game up. It was the eighth career multi-homerun game of his career. The fifth inning is when the game got away from Washington. Rollins and Philadelphia’s newly acquired right fielder Nate Schierholtz hit back-to-back homeruns (plus Rollins’ first one in the third inning) to take the lead. Three homeruns is the most Jackson has allowed in a start all year. Philadelphia’s starter, right-hander Vance Worley, put up solid numbers against the Washington offence. The Nats managed just six hits and two unearned runs off him in seven innings pitched. The only real action for Manager Davey Johnson’s lineup was with one out in the first inning when outfielder Bryce Harper (2-for-4) and third baseman Chad Tracy scored. Harper scored on a sacrifice fly hit by first baseman Adam LaRoche followed by Tracy reached home on a fielder’s choice when second baseman Danny Espinosa grounded into a force out. The Washington bullpen were the true starts of Wednesday’s contest having given up just one hit in eleven batters faced. Left-hander Sean Burnett gave up that hit to pinch hitter Ty Wigginton, but right-handers Michael Gonzalez and Ryan Mattheus both faced the fewest amount of batters possible, making their outing a success. This series feels like a funny reverse rerun of the last few years, where the Nats would somehow win against the Phillies when it didn’t matter much for either team.